Earlier today we heard that Google had decided to close down their Google Reader RSS app on the 21st of July, and a petition to keep Google Reader alive has appeared online and it already has over 40,000 signatures in just a few hours. I signed the petition myself around two hours ago, and that time there were 30,000 signatures, so another 10,000 people have voted to keep Google Reader alive in the last few hours. Whether or not this petition will make Google change their mind about Google Reader remains to be seen, maybe if enough people sign it Google will realise that a lot of people use Google reader on a daily basis, myself included. 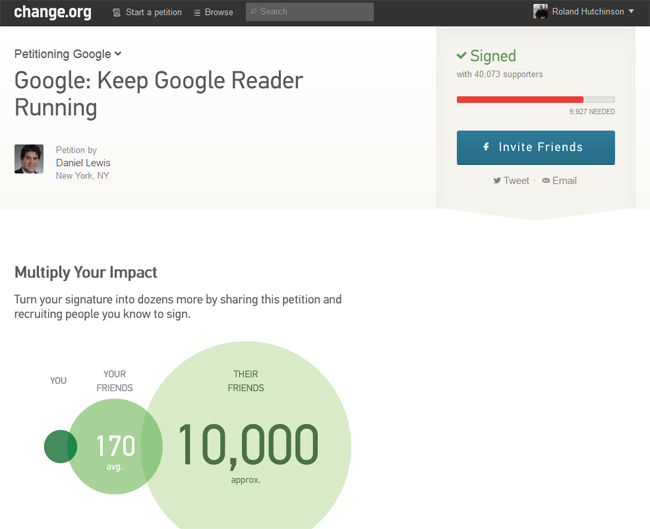 You can find out more details about the Google Reader petition over at Change.org.